In an effort to encourage more haredi adults to join the workforce the first of six ultra-orthodox oriented job placement centers was dedicated in Jerusalem Wednesday. The five remaining centers are expected to open their doors for haredi communities throughout the country in the near future. The Joint (American Joint Jewish Distribution Committee – JDC), which is backing the project along with the state, has been involved in integrating the ultra-Orthodox community into the workforce since 1996. So far some USD 10,500,000 has been invested in the initative, with almost 2,000 new workers enrolling in the various training programs. Jerusalem center director Naftali Flintstein told Ynet that expectations are running high. "The phones are ringing off the hooks," he says, despite the fact that the formal advertising campaign has yet to be launched. One of the applicants is Shira Nardi, a 21 year old ultra-Orthodox woman who attended secretarial school and now hopes to find employment through the center. She describes the change undergone by the haredi community in regards to employment as "a revolution." "Everything's been cut back, you can't live off of what you get anymore," said Shira, attributing the extreme change to the reduction of government stipends for child support. The 'revolution' however is far from complete as more than a few Rabbis voice there concern over the change. "It's hard to say that all the Rabbis are encouraging employment," said Flintstein who acknowledges that there are still setbacks to overcome, "but certainly is a man reaches a situation where he has difficulty supporting (his family) then he must go to work. He is told to do this and not remain in his current situation." The only Rabbi who has publicly addressed the issue is the Rebbe of Belz, Rabbi Issachar Dov Rokach who last year called on his followers to obtain a profession and encouraged them to joint the workforce under certain conditions. He said, however, that unmarried women were not to work. After marriage they may work since the burden of supporting the family falls on their shoulders. The men must of course study Torah throughout the day. 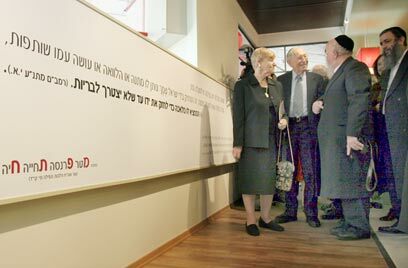 See all talkbacks "Haredi job placement center opens in J'lem"